I believe in writing about important things. Hence, this article on colorful tuxedo T-shirts! You can get your tuxedo T-shirt in basic black, or you can choose to go "full color" and be a scamp in a tuxedo T-shirt from your selection off the visible spectrum. The choice is yours -- and really speaks to the "character" you are trying to be when you wear your tuxedo T-shirt. Who are you? Are you the type to play in a "stuffy", basic black tuxedo? Or are you the kind to sample from the rainbow -- maybe even owning different color tux T-shirts for different days? In our glorious age, the choice of what color tuxedo T-shirt to wear is all yours. 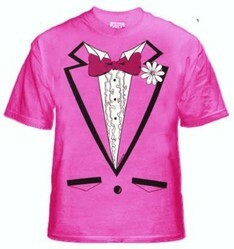 I think BeWild nails the right look of a colorful, campy tuxedo T-shirt. 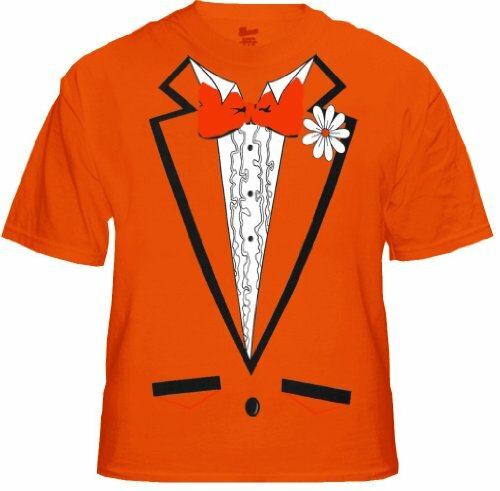 In orange, they sell, a tux shirt design that gives the full impression of a waist-length tuxedo coat. It's a snazzy look. It gives the impression of ordering an Orange Julius "Shaken, not stirred." There are lots of blue tuxedo T-shirts out there. The one that really stands out for me is the one its designers call "Old Skool". 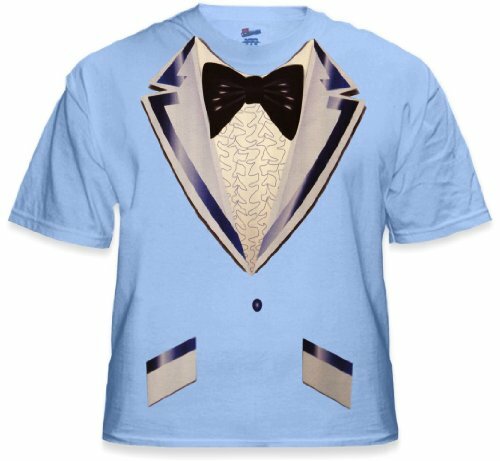 This blue tuxedo T-shirt also just happens to be from BeWild. It seems they really have this market cornered, and good for them! 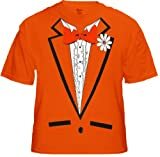 If you buy this T-shirt that gives a phony blue tux experience, be ready for a throwback look that hearkens to the 70s, and that ain't no jive, Turkey! Who Needs a Real Tux and Tie When You Have Tie-Dye? Art2Shirt has it all figured out, "Man!". 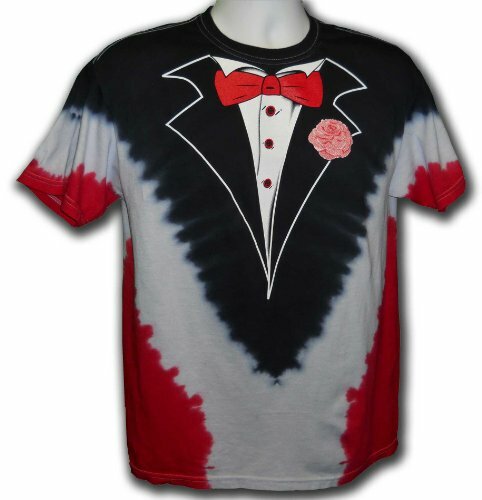 If you want to be the finest dressed hippie at Burning Man, you may not be able to pass up their tie-dyed tuxedo T-shirt, especially in red, white, and blue! The shirt is 100% cotton, full-cut, with double-needle hem and sleeves! If you are hanging out with hippies, make sure you are the one who is over-dressed with this "way out" tuxedo T-shirt. Much as I love BeWild's orange tuxedo T-shirt, I have to say I adore the version they sell in pink. I think pink just drives "the look" home -- campy, yet somehow, classy. 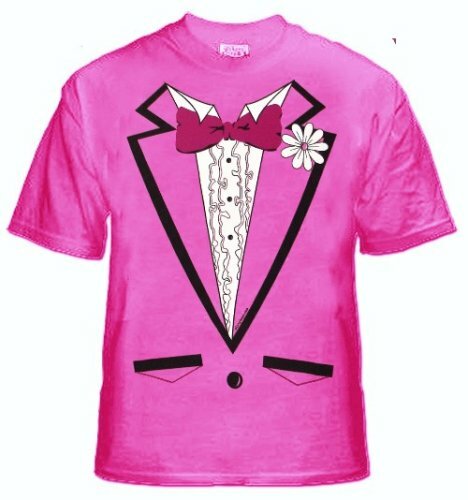 I'm thinking right now of the modern versatility of a pink tuxedo T-shirt. Wear as a joke -- just for laughs! -- or as a humorous way to redouble an important message -- say, at a pink ribbon charity event. Who says we can't laugh as part of the quest for a cure! Go Green for St. Pat's! 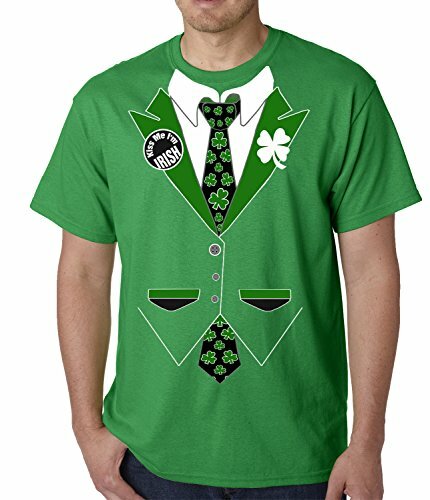 A popular St. Patrick's Day look is that of a leprechaun's tuxedo. BeWild knocks it home again, with an entry that includes a full shamrock tie effect. They even included a "Kiss Me! I'm Irish!" lapel imprint. Blarney! Perhaps, it is odd to make a list of places where NOT to wear a color tuxedo T-shirt. Well maybe, a list of tuxedo T-shirts itself is odd! Maybe, this is all quite random. What else have you come to expect from Regi B.? The author who refers to himself in the third person! So here, read this here list of places not to wear a full-color tuxedo T-shirt!